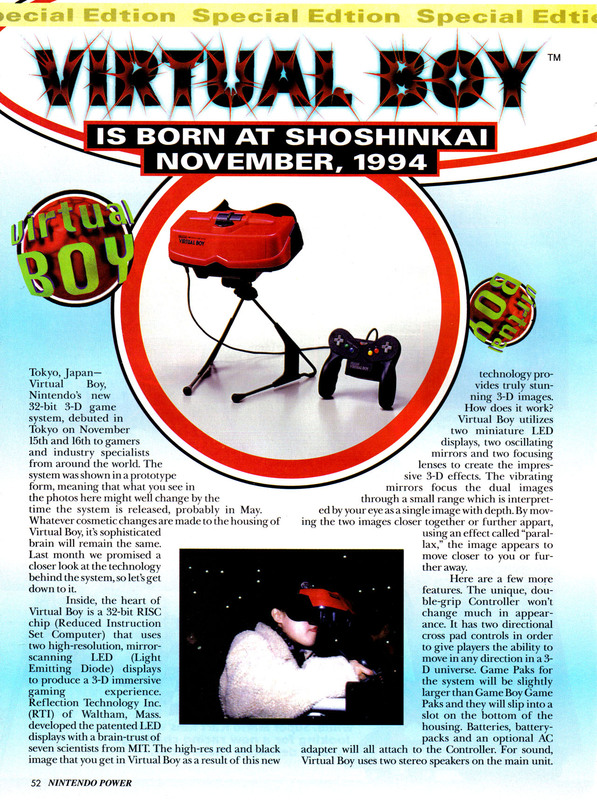 This article is about the Virtual Boy game Mario Clash. For the microgame of the same name, see Mario Clash (microgame). 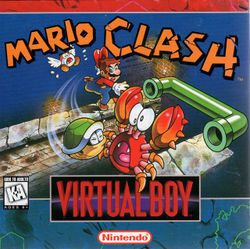 Mario Clash is a game released for the Virtual Boy in 1995. It is also the first 3D stereoscopic Mario game. The game is a return to the style of the original Mario Bros. To progress through the game, Mario must knock enemies off platforms using Turtle Shells. There are always two Koopas; if one gets knocked off, another one takes its place. Many enemies need to be hit from the side, thus Mario must throw shells from the background to the foreground and vice-versa in order to knock them off. The Clash House Tower has been invaded by bad guys! It's up to Mario to clear them out, throwing Koopa shells to knock them away. Take care as you battle in dangerous rooms of narrow ledges connected by pipes. Mario battles Thornies by throwing Turtle Shells from the foreground to the background. Cameos from other Super Mario series characters appear in a Nintendo border after every 100,000 points scored. 100,000 points Mario saying "Good!" 200,000 points Toad saying "Great!" 300,000 points Yoshi saying "Wonderful!" 400,000 points Luigi saying "Marvelous!" 500,000 points Wario saying "Superb!" 600,000 points Peach saying "Fantastic!" 700,000 points Bowser saying "Astonishing!" 800,000 points Donkey Kong and Donkey Kong Jr. saying "Amazing!" 900,000 points A group photo of Mario, Luigi, and Peach saying "Incredible!!" 999,999 points An enemy cast roll holding white flags under the text "All right, that's it- you win!" Mario Clash was originally a mini-game which was seen in VB Mario Land, an unreleased Virtual Boy game which was shown at the Winter Consumer Electronics Show in Las Vegas, 1995. 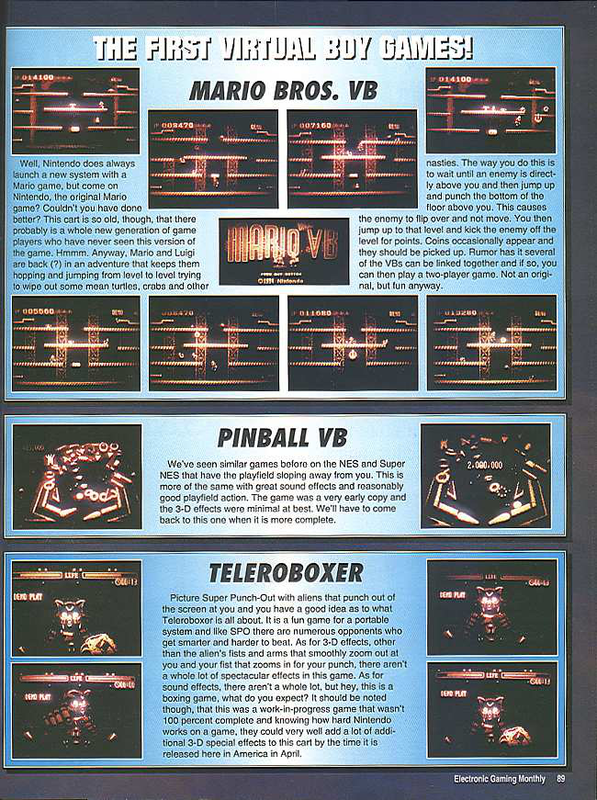 The game Mario Bros. VB itself was a earlier version of Mario Clash. It was shown as a demo game at the Shoshinkai expo in Japan, which took place on November 15th and 16th, 1994. 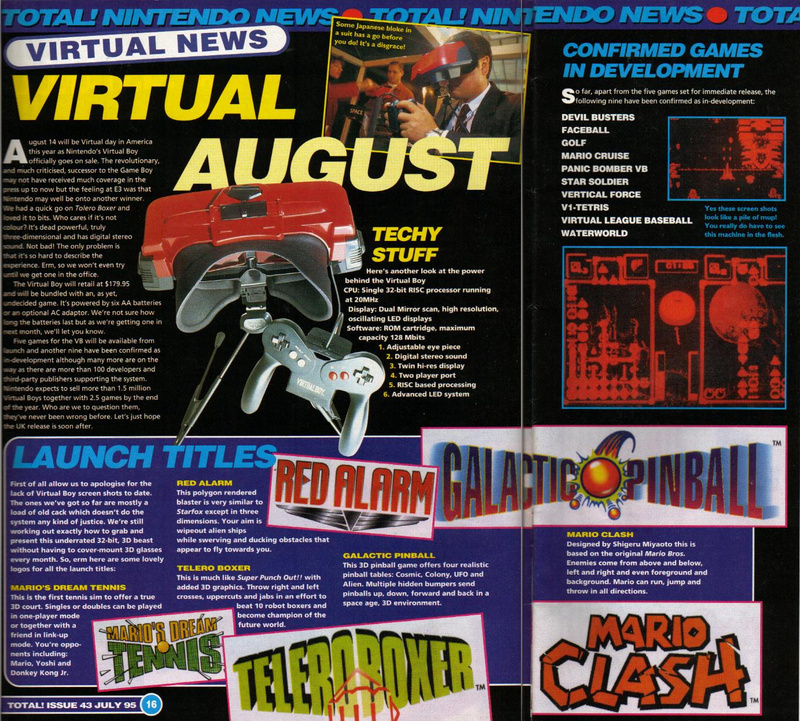 The Electronic Entertainment Expo in May 1995 revealed that the Mario Bros. minigame (which was previously known to be included in the VB Mario Land demo), was now being developed as a stand-alone game titled Mario Clash, which was planned to be released as a launch title for the Virtual Boy. For unknown reasons, there were no further reports of VB Mario Land being developed. The game received mixed reviews. ScrewAttack named this video game "The second worst Mario video game of all time", while other reviews were more positive. 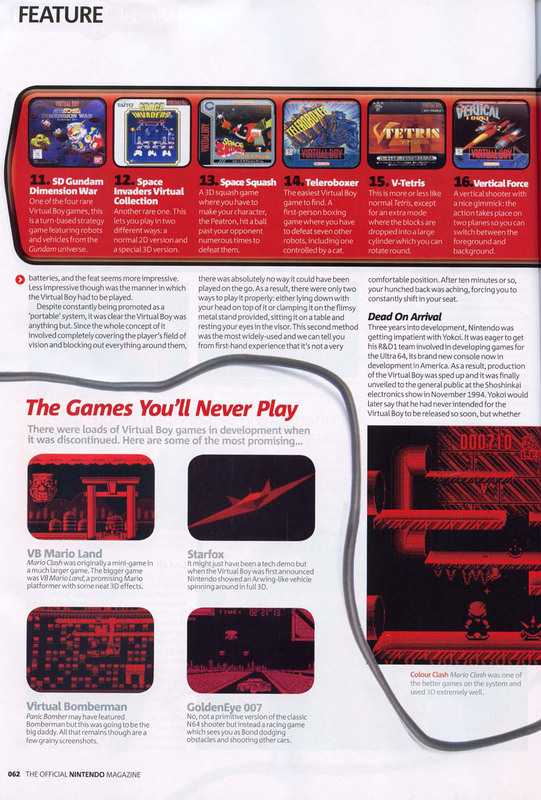 The Video Game Critic gave it an A and called it a "must have for Virtual Boy owners". For this subject's image gallery, see Gallery:Mario Clash. A Mario Clash microgame appears as one of 9-Volt's microgames in WarioWare, Inc.: Mega Microgame$!, and one of 5-Volt's in WarioWare Gold. The Snake artwork closely resembles the Sablé Prince's snake form in Kaeru no Tame ni Kane wa Naru, but without a cape. This is more noticeable in his role as an Assist Trophy in Super Smash Bros. for Nintendo 3DS / Wii U and Super Smash Bros. Ultimate. ↑ Electronic Gaming Monthly magazine from January 1995, page 89. This page was last edited on April 24, 2019, at 11:41.